A lack of motivation, productivity, and drive cropped up quite early on this particular Friday. I’m thinking somewhere around 3 a.m. because I woke up shortly after that to go to the bathroom and I cared so little about making the trip I just went back to bed. (I held it, don’t worry.) I woke up next at 8:30 a.m., obviously completely having forgotten that Friday is generally a day that I must appear at work. The good thing about Fridays is that the line for many between appearing and performing at work is blurred at best. This is certainly the case for me with the exception of this Friday, where even making an appearance is going above and beyond. Performance didn’t stand a chance. 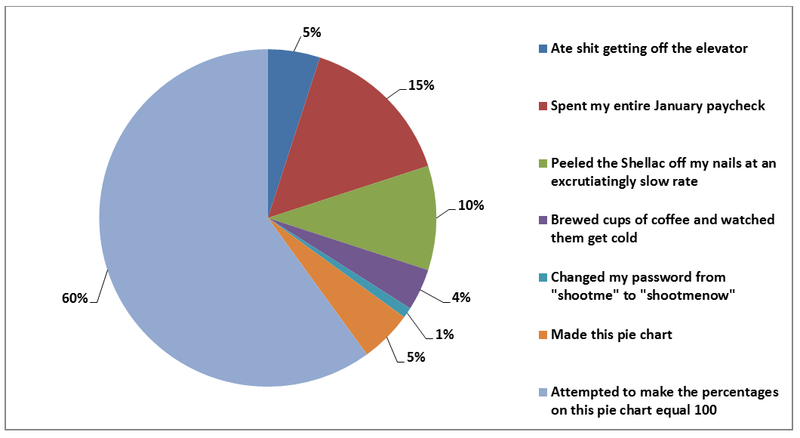 So, to ring in the New Year with the first Pie Chart Friday, and because I knew from the minute I rolled over in bed in lieu of using the bathroom that I wasn’t going to be doing anything of consequence today, here is a breakdown of what, exactly, I have accomplished. Given all the time I’ve had on my hands today, I threw around the idea of creating another pie chart to detail exactly what items I have not accomplished. Since that chart would inevitably have contained a large number of work-related items–and this seemed a bit too close to actually working than I was comfortable with–you’ll have to make do with this single look into my lazy malaise at the office today, with my apoligies thta Ii jasut cna’tar care enoutg jto dardsat anttoo ….. …. … ..